Saturday December 3rd 1881 I was busy about the work most of the forenoon Hatt was over to dinner and Mother went to town with her Win came over in the afternoon I worked on my fancy work afternoon and evening. Sunday December 4th 1881 I went to church in the forenoon and down to Hatts to dinner. In the afternoon I wrote to Charlie, Mr Norris, and Will Reed. I played on the piano all the evening. 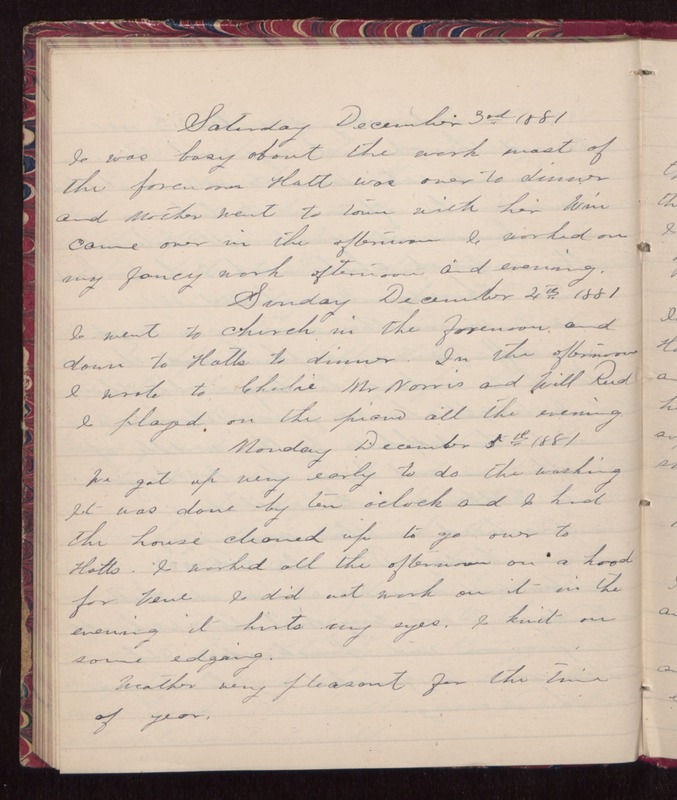 Monday December 5th 1881 We got up very early to do the washing. It was done by ten oclock and I had the house cleaned up to go over to Hatts. I worked all the afternoon on a hood for Vene. I did not work on it in the evening, it hurts my eyes. I knit on some edging. Weather very pleasant for the time of year.